Special glue for metal, wood, paper, cardboard, glass, textiles and plastics. Contacta Liquid Special is specially designed for joining chrome parts, but can be used for a variety of other materials. Prevents cracking in joints. Adhesive can also be used on transparent parts such as windows or cockpits, as it does not interfere with transparency. 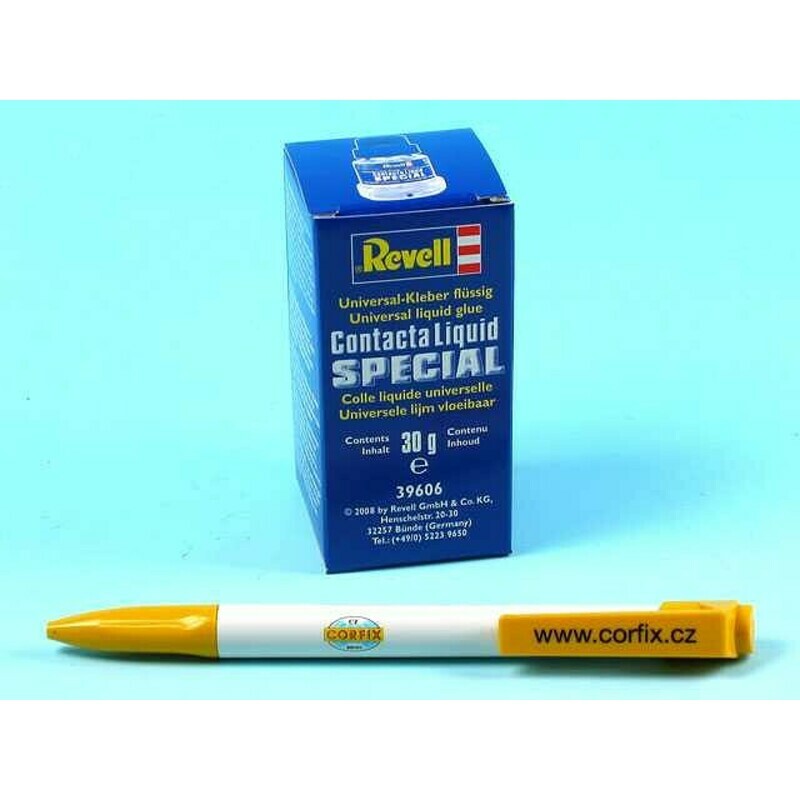 Revell Contacta Liquid Special glues metal, wood, paper, cardboard, glass, textiles and plastics. Package content is 30 g.
Application: Apply a sufficient coating to porous materials, very smooth on smooth surfaces, always on both glued sides. Press both pieces together for about 2 minutes. Highly flammable liquid and vapors. Causes serious eye irritation. May cause drowsiness or dizziness. If medical assistance is required, keep the packaging or product label at your fingertips. Keep out of the reach of children. Read the label information before use. Protect from heat / sparks / open flame / hot surfaces. - No smoking. Avoid inhalation of dust / fume / gas / mist / vapors / aerosols. Store locked. Dispose of the contents / container in accordance with local / regional / national / international regulations.